This is the "project" I got off my to-do list yesterday. I made 20+ of these yesterday for a swap. Last minute of course, that is my style. It is postal though!! There are a couple "sneak peaks" here from the upcoming Occasions Mini Catalog!! It's packed full of great new goodies!! The card base is Chocolate Chip. The background layer is a new sheet of Baja Breeze DSP from the Walk in the Park set. 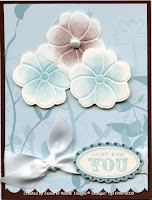 The flowers were made using the Bigshot and the Simple Flower Embosslit from Shimmery White CS. I decided it would sure be nice to have more than one Embosslit when you have to cut 60+! ha! And it was a stormy, very windy day here in Nebraska so there wasn't much else to do!! After cutting the flowers, I sponged classic ink on them, some in Baja Breeze & some in Chocolate Chip, using a sponge dauber. I added a medium half pearl from the Pretties Kit to the Chocolate Chip. The bottom edge was punched with the Scallop Edge punch. The ribbon is NEW White 5/8" Satin ribbon. Very pretty!!! I wish we had more colors of this-it really dresses up a card! Did you notice the NEW Scallop Oval punch??? It coordinates with the large oval already in the catalog. I stamped the Just for You (from the NEW Oval All set) twice, once in Chocolate Chip on Baja, and once on Shimmery White in Baja. I will hope to be back on Thursday, but I'm not promising! Finishing up our taxes is tops on my to do list now with several other tasks that need to be done as well! Absolutely to die for card! I'm sure that all your swappers will absolutely love them!